Potholders can come in all sizes and colors. 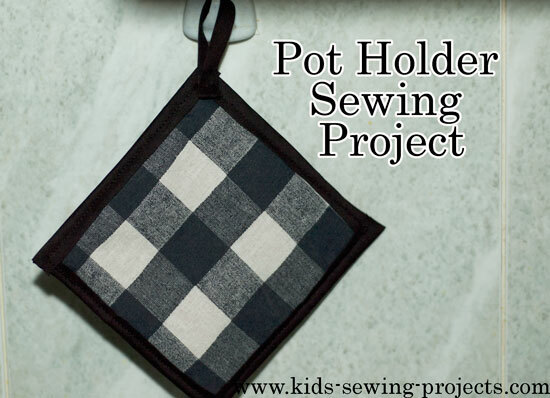 Here are instructions on how to sew an easy pot holder. Place two pieces of felt in between the two pieces of fabric with the fabric right sides facing out. Pin bias tape all around edges. One side of the tape should be on one side of the material and the other side of the bias tape should be on the back side of the material. Learn more about binding edges with bias tape. Sew in place. Make a loop out of bias tape and sew in the corner. This project was designed for a Girl Scout Sewing Day. The girls participating were in grades 3 and up, and they had a great time learning how to use a sewing machine. 2. Press seam toward one side. 4. Pin pieces along one side, with right sides together. Align pieces so centers meet. Sew together. 5. Press seam toward one side. Set top piece aside. 6. 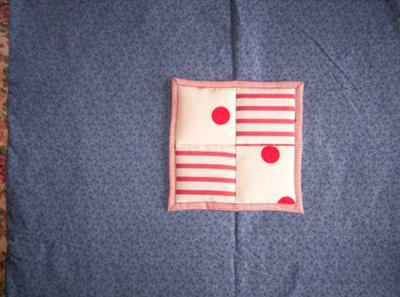 Take large fabric square and place insul-bright in center. Work clockwise around the square. Beginning at center of one edge, fold fabric to meet insul-bright and pin in place. At corners fold fabric to make a triangle. Continue to work around square. 7. Press folded edges. Remove pins and open up the fold just made. 8. 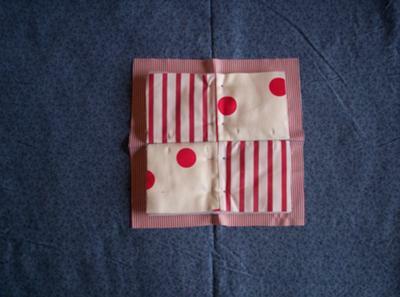 Make a fabric sandwich. Layer pieces in the following order. 9. Place four pins along one center seam. Begin and end stitching line at edges of top fabric piece, and stitch in the ditch down center seam. Be sure to backstitch at ends. 10. Repeat Step 9 with remaining center seam. 11. Pin corners and edges of the top of your sandwich down through all layers. 12. Using pressed seams created in Step 6 and 7 on the bottom fabric piece, you will now make the self-binding edges for the potholder. 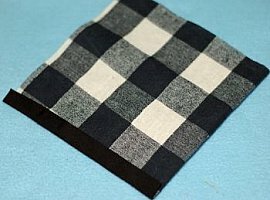 Fold edges on bottom piece of fabric towards sandwich layer just like before, then fold again up and over the top of your sandwich. Pin folded edge to top layer, keeping pins close to inner edge. Remove extra pins used in Step 7. 13. Beginning along one edge and continuing around the square, top stitch the self-binding just created. Keep seam near inner edge of folded over fabric. At corners, make sure needle is in the fabric then lift up pressure foot to turn corner. Put foot down and continue sewing. Back stitch at end. 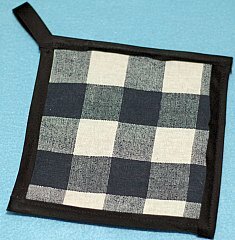 Take me to a similar project making a placemat from sewing a potholder.